I’ve been away for the last couple months. Work has kept me busy, really busy. I’ve also needed time to regroup and focus on what is important so as not to get scattered. My rituals have been simple and my meditations brief. I could probably use a lot more time to just sit and breathe. I’m looking forward to the holidays to get my balance back and to reconnect. Actually, just the act of writing this blog right now is having a surprisingly calming effect. I did a journey not long ago and asked how do I get my balance back. I saw myself aboard a ship in the middle of a storm. There was one message: Get off the ship. So that’s what I am trying to do. Life sometimes feels like it is setting the agenda and it takes a lot of energy to get the control back. The hardest part is usually to recognize the madness as out of control. And then to stare the beast down and rise above it. So that’s what I am trying to do. I’m also trying to reconnect with what brings me joy. You know, the feeling deep in your being that takes over and makes you laugh uncontrollably, or create wonders, or sigh in deep contentment. I wish you many of these moments. The moral of the last few months is that there is a time to focus entirely on you. The world is usually all the better for it. Tonight, the whole family lit a candle to help the sun come up. We made wishes for our happiness and for there to be light in our world. It was simple. The candles are still burning bright behind me. As we enter the time of celebration of this light, whatever we may call it, I make a wish to reconnect with Joy. May the light shed our fears and bring out the authentic self we were born to be. I want to share a video that will change your vision of what it means to be different (and I think we can all relate with that…) It completely fits with my last post of trusting something deep inside. The take-home message: Stop learning, start thinking, and create! This post is also in response to the news story of this woman in Ontario who sent a letter to a neighbor (who has an autistic son) saying that autistic people should be euthanized. As a therapist working with people with special needs and as a mother, it pains me that there is still such stupidity in the world. I’d like to share a little bit of awareness about this condition. I used to believe in this myth of Autism. I’m a health care professional. It kind of comes with the territory. I’m not saying that it doesn’t exist, but the more I lived with it, the more it became this AMAZING thing. I don’t want to minimize what families are going through. It’s tough! Every single day!!!! And some days you just want to go fetal and let yourself wither away. But the truth is that there are people in this world who think differently, who are evolving different abilities. Us magical people go through exercises to expand our senses to another level. These people are born that way. Picture this: We process about 8 pieces of information every second. We filter out everything else. Autistic people process between 30 and 200. The strongest hit are the ones who are constantly bombarded by stimuli. This means that they smell everything, hear everything, feel their very own clothes on their bodies… at all times. They live in a ‘wave’ of sensory stimulation. Others can still manage the information coming in, but they live in a heightened state. They will notice the detail in a picture that escapes everyone else. They won’t be able to keep a conversation because the crickets are too loud. The stories in their heads take over the whole world. But they are smart! Many have IQ’s that are well above average. It is a huge spectrum. And because the world is so unpredictable and that they get constantly surprised with incoming stimulation, they like to keep their world predictable and they are susceptible to meltdowns and anxiety. It is just tough to be so stimulated all the time. And it is tough to be constantly expected to live as if this is not all happening. I started this paragraph with the ‘myth’ of Autism. Autism is an opinion. It is again an imposition of what is normal. But I think the following videos speak for themselves. We should be amazed by these people and let them develop their beautiful gifts instead of stuffing them in the same box with the rest of us. Doreen Virtue has written extensively about these Crystal children. So this topic flows perfectly from my last post. Time to think outside of the box and to use whatever gifts are given to us. So the first video is about a young boy named Jacob Barnett. He is 11 and just got a Ph.D. in astrophysics. His pre-school teachers thought it would be a waste of time to teach him to read. The second video is about Temple Grandin who explains how her brain works in images. This ability allowed her to revolutionize the way we handle livestock and how to treat animals humanely. These videos speak for themselves. Take a few minutes and be amazed! An Esbat of Power to you! Last week, my son had to go under general anesthesia. After his first dental work, he developed a total fear of the dentist. So despite the fact that he had only minor work to be done, anesthesia ended being the final option. We looked to every possible option and it really came down to that. As an occupational therapist, I had seen plenty of surgeries gone very wrong, so naturally I was worried. After he had gone under, I went back to the waiting room, surrounded by all the other parents who had children in there. I had read somewhere (though I looked, I couldn’t find where I had read it) that soul loss can happen during general anesthesia. Shamans use soul retrieval techniques to find missing pieces of people’s souls that can happen during trauma or soul theft. I have taken a number of workshops in shamanism, but I had no idea how to do a soul retrieval. But this was my son and I was going to do whatever it took. I sat cross-legged on my chair in the waiting room and closed my eyes. The other parents probably wondered what the heck I was doing, but I so didn’t care. It was my job to protect my little guy. I journeyed out into the middle world. I ‘got up’ and walked right through the wall to my son’s bedside. I called my guides, I talked to him, I surrounded him with a bubble so that his soul would stay close by. I guarded without pause to make sure that no pieces of his soul wandered off. Then, in an instant, my focus broke and I was back in the waiting room. The connection was completely severed and though I tried and tried to get back in there, I just kept bouncing right out. What was going on? Then I understood. They had just taken him out of the anesthesia! And as I realized that, the dentist came out and told us they had moved him to recovery. Everything went well and he woke up without problems. Relief all around. The reason I am writing this is that we are taught to fear, to not trust our deepest instincts, to surrender control to those who know best, to follow the Establishment. I didn’t know how to do a soul retrieval. And yet, I KNEW! I knew how to protect my son. And I did! I just went deep inside and did what I thought was the right thing despite what might have looked completely crazy to all those other parents. It wasn’t crazy or irrational. The fact that I knew when it was over confirmed to me how real this power was. You must understand that I am probably the most normal person around (well, at least, I think so….) I’ve been involved in magic and paganism for over 15 years. But I I imagine dress like a hippie, own an occult store of some kind, do Tarot consultations and workshops for a living, etc…. It is not what my life is like at all. I am the person you sit next to on the bus. I work my day job, manage my business, get my kids to school… My day to day is no different from yours. I need to repeat this: I am no different from you. That night, I felt greatness fill my whole being. I felt like I had honored my sacred duty to do what was right and not to follow blindly what was being told to me. I took my own power back. I had power to help my son, a power which was irrational to most and I used it. I left the doubt behind and reached within to find that power. There are many in this world who would have us believe that we are powerless, that someone else knows better. But our power is infinite, beyond belief. Your power is infinite beyond belief. You KNOW what needs to be done and how to do it. I am not just talking about magic. Magic is just a technique. What matters most is believing, reading the signs of the times, seeing what the universe is telling YOU. May this full moon bring you a taste of this greatness that is within yourself. Blessed be! 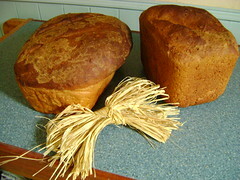 Loaf Mass was the christianized version of this Sabbat, where the first harvest flour was used to bake bread. This bread was then placed on the altar at mass as an offering. Bread is such an important symbol in Christianity. More than a commemoration of the Last Supper, it is also a symbol of our life’s work and how that work is our own personal offering on the divine altar. It marks a change from the offering of sacrificial animals at the Temple altar to our own offering of what we do with our lives. We stop offering others’ blood and start giving our own sweat. Harvest is a symbol that outweighs words. Isn’t it the basis of our survival and the basis for all our celebrations? The combination of offering bread and commemorating the work that brought it about is such a powerful image. You recognize a tree by its fruit. Harvest time is that time to honor the work you have done all year and to give thanks for the fruit it has borne. May your harvest be plentiful! I attended a 2-day workshop on Shamanic Dreamwork. I don’t know how much I wrote about Shamanism on this blog, but I think it is the tribe that I feel most comfortable in right now. The people that compose it are varied, very down to earth and very conscious of being in a state of personal power. I am lucky that Montreal has a thriving shamanic community offering the courses of the Foundation for Shamanic Studies. I sign up for the workshops whenever they are offered. This weekend was a workshop on Shamanic Dreamwork. At the beginning of the workshop, we were taught about the concept of ‘Big Dreams’. Big Dreams are dreams that are particularly vivid. You feel them on different sensory levels and you usually wake up with a very strong feeling. I looked back and I realized what a great part dreams have played in my spiritual journey. I can go back at least to the age of 10 and remember some of these great dreams. Whenever I would go to sleep with a pressing need for assistance, I would always be graced with a dream that would give me an answer to my query, or comfort, or guidance. They are stuck in my memory, as if I had actually been there. Shamanic dreamwork goes much further than simply ‘interpreting’ dreams. It is truly about journeying to understand what the dream is telling us, what the spirits are telling us through the dreams. We also worked with dance and singing and tribal dreams. We journeyed for others. We journeyed to recall universal dreams. If the drum beat calls you, go and have a look.